The Expedition 19" Aluminum Transport Chair in blue by Drive Medical comes standard with 12" rear flat free tires to ensure a smooth ride over most surfaces. 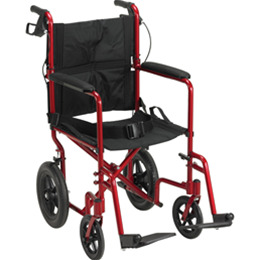 The companion activated wheel locks and seatbelt make the Expedition Aluminum Transport Chair safe and easy to use. The back folds down for convenient storage and transportation.